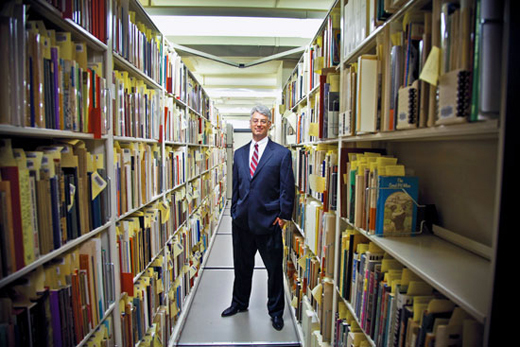 Randy Gue, curator of Modern Historical and Political Collections at MARBL. Moving from suburban Cleveland, David A. Lowe was looking forward to a change—a different part of the country, better weather, a new intellectual environment—when he enrolled at Emory in fall 1988. He had no idea how much his presence would change the university. As an openly gay freshman, Lowe attended a meeting early that first semester of the Emory Lesbian and Gay Organization (ELGO) and was met by a very small group of about a dozen people who, he says, held occasional meetings and social activities, but little else. But then things started to get interesting. "We started getting more active and visible, speaking at freshman dorms and organizing campus events. At some point, ELGO invited a guest speaker from ACT UP Atlanta, and I was just blown away. In the suburbs where I grew up, the AIDS crisis wasn't talked about and gay issues in general were rarely discussed and there was not much activism. I found it refreshing that there was this group of people being vocal and being active and engaging with the media," Lowe says. "I thought, 'This is what the LGBT community should be doing,' not just with respect to AIDS, but in politics and on social issues." Lowe began participating in ACT UP meetings and community events—including several AIDS protests, and subsequent arrests, at the Centers for Disease Control and Prevention (CDC), CNN, and the state capitol—and brought that energy back to Emory. He started working with others in ELGO to increase visibility and engagement on campus; building awareness of lesbian, gay, bisexual, and transgender (LGBT) student needs; and advocating for increased resources. During his four years at Emory, Lowe saw growing recognition of LGBT issues on campus—including advocating for the establishment of the university's Office of Gay, Lesbian, and Bisexual Student Life (now the Office of LGBT Life)—accompanied by a groundswell of new LGBT organizations on campus and growing influence among Emory's LGBT community. By his junior year, acceptance of gay and lesbian students on campus had progressed so much that Lowe narrowly lost election as SGA president as an openly gay candidate.